After a hard days work or a hard workout, there is nothing better for your mind and body than a bath. Light a candle put on some music and switch off relax and soak. For hundreds of years submersing the body in water has been associated to relaxation and general wellness for both the body and the mind. Find below my tips on specific baths and some great products that go hand in hand with them. Nobody wants dry ashy skin so this is a good tip to get into your monthly regime. It’s also a great way to improve detoxification. Dry skin brushing is an age-old health and fitness technique that has been used by Russians and Scandinavians to promote healthy skin. The Japanese love to brushed their skin before a hot bath. Regular skin brushing helps eliminate harmful elements from the body and improves blood flow and lymphatic circulation. Skin brushing also stimulates new skin growth. So you have had a tough day at work or you’re just feeling like having a good old soak. I know many people who take an iPad and a glass of wine in the bath (not literally) and spend an hour relaxing and soaking. A great TV show or book is a great way to indulge and shut off. This sounds good to me although I'm not sure an hour, but if you are this type my tip would be to make sure you get some good stuff in the bath such as Magnesium Salts and Lavender Oil. A long soak in Magnesium Flakes is so good for you and perfect for those of you who train, it’s also a great sleep aid so perfect for the evening. Yes, this is possible and for me this is all about awakening your senses and body. If you are heading out and decide to have a bath you simply need to switch the relaxing ingredients for something more invigorating. Body scrub and put on some good music and you are good to go. I like to mix my own oils and here is a good bath oil for a lively awakening soak. Directions: Mix above ingredients in an amber glass bottle. Add a tbsp of this blend into your warm bath, stir well and get in. I love ice baths especially after a gruelling run or leg session. Use your tub or if you don't have one you can always get a really deep bin and fill it with the hose as I did when on holiday! Just make sure you don't fall over.Start off with a cold bath but don't add loads of ice making the water temperature too cold. Most rehabilitation specialists recommend a water temperature between 54 to 60 degrees fahrenheit. Work your way in and then add ice to start with. If I have a very cold ice bath I will do rounds of 1 min in and 1 min out to stimulate and get better blood flow. Keep it short between 5-10 mins and play with intervals or colder temperature. You will get the benefits from a 5 min session so any more is unnecessary and also potentially dangerous. Stay still and don't let the kids come in and throw toys in as I learnt, moving water is much colder and not pleasant. Making your own ice bath daily is a lot of work so look for a gym that has a cold plunge, or if you live close to a river, lake or the ocean, keep tabs on the current water temperature. Cold sea water is awesome. Also don't rush to take a warm shower immediately after the ice bath. The natural warming that your body initiates is perfect. Treat yourself when you feel under the weather with C.O.Bigelow's herbal 'Cold and Flu Soak'. The cure-all formula is blended with immune-boosting Willow Bark and Ginger extracts and pure essential oils including Eucalyptus and Peppermint. A few capfuls in a hot bath is all you need to open nasal passages and soothe body aches and pains. Be sure to have it on hand in the winter months. 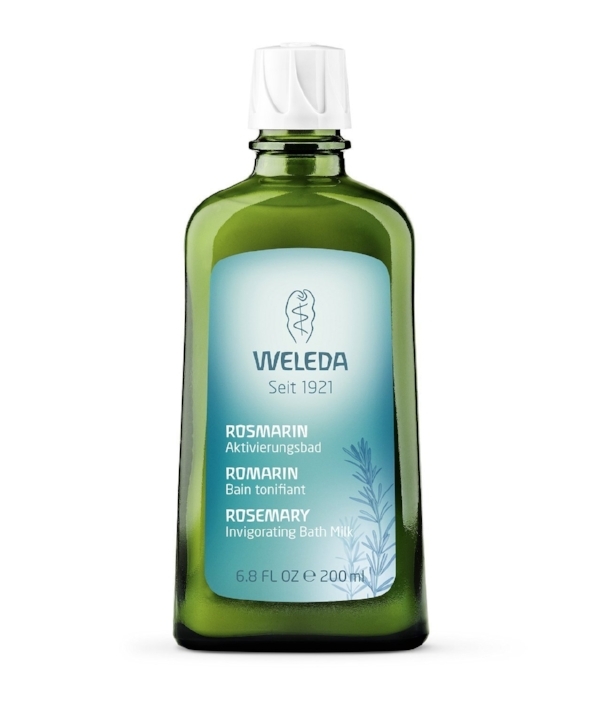 Boasting a warming blend of leaf oils and sun-soaked rosemary scents, the Weleda Rosemary Invigorating Bath Milk (200ml) is a refreshing pick me up that works to stimulate circulation and drive away any feeling of tiredness. Working to invigorate and liven the senses, this bath milk is suitable for vegans and can even be used in the shower too. When the days turn cold and wet, Norway spruce essential oil is an invaluable aid. It supports your circulation and, together with the warm bath water, offers intensive, long-lasting warmth for your body – both inside and out.The resinous Norway spruce fragrance has a calming effect and lets you breathe freely while jojoba oil gently moisturises your skin. A blissful bathing product for cold, windy days. This bath bomb is packed with antioxidant goodness and will fill your bath tub with fizzing whizzing colour and fragrance. Infused with a wild strawberry fragrance, this sweet formula will calm your inner wild child and restore your day with help from sweet orange essential oils and super fruit extract, Goji Berry. Step in and be the brew. Liquid Yoga helps soothes tired, aching bodies. No other bath treatment is as rich in incredible actives and smells as delicious. Magnesium-rich Epsom salts and Arnica and our wonderful blend of V-TonicTM, spearmint, cypress, lavender, mandarin and chamomile essential oils, all help to ease your stress and anxiety. Murumuru Butter gives your skin complete nourishment so your skin feels as good as your mind upon stepping out of the tub. Team with our Liquid Yoga Candle for real relaxation. Inspired by the Japanese Geisha bathing ritual of perfuming baths with real peaches, this Fresh Rice Sake Bath includes an infusion of exquisite fruit and 38% real sake for an unparalleled sensorial experience. This delicately foaming, therapeutic soak increases circulation and body temperature, inducing a purifying sweat to eliminate toxins. Sake also contains enzymes that hydrate and smooth the skin's appearance. It is further enriched with pine extract, which promotes easy breathing and pure ginger to render muscles pliable and relaxed.